Posted on Fri, Jan 13, 2012 : 5:57 a.m. 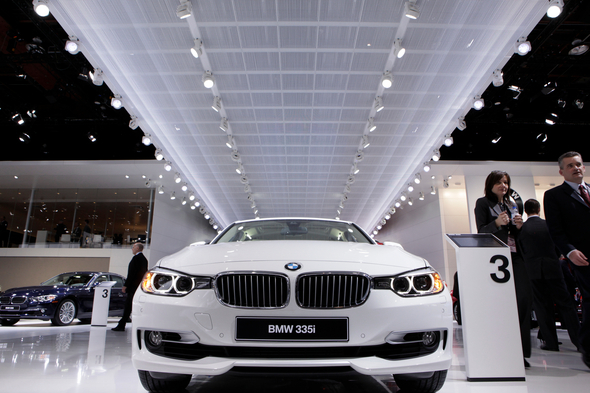 The new BMW 335i is on display at the North American International Auto Show in Detroit. The focus of the North American International Auto Show is back on the product — cars, in fact, fun and entertaining with nary a pickup truck or van in sight. With 2011 vehicle sales up in the U.S. and China for domestic, European, and some Asian manufacturers, capital is readily available to put concepts into sheet metal and now even carbon fiber. The auto show, which opens to the public Saturday at Cobo Center, started with press previews Monday and Tuesday. Multi-mode hybrid vehicles and plug-in hybrids. Lighter weight vehicles with aluminum, higher strength steel, carbon fiber. Very simple dry ice and drop cloth reveals of concepts and new models. Vegan, seaweed, wheatgrass, and beer fuel systems. Toy and Transformer inspired concept trucks and SUVs. Six-passenger sedans with bench seats and V8 engines. Winter coats - as reported by the gracious coat check ladies. Vehicle product planners must have had a jump on forecasts for balmy January weather in Detroit, as no less than seven new droptops were introduced. For fresh air fans, check out the BMW 3 Series, Mini Roadster, Mercedes SL, Porsche 911 Carrera Cabriolet, Infiniti IPL G, Volvo C70, and the undoubtedly Porsche Speedster-inspired irresistible VW E-Bugster concept BEV. Teens and car enthusiasts always want to know what futuristic concept vehicles they should scope out at the Detroit auto show. If you like low, sleek two-seaters, check out the carbon-fiber-clad BMW i8, budget friendly Chevrolet Tru 140S, Chevrolet MiRay, Acura NSX, Lexus LF-LC and Falcon F7 Supercar. Chrysler Group, along with its Italian parent Fiat, certainly has something for everyone at the auto show. With a starting price of $15,995, Dodge should sell plenty of the new Dodge Dart based on an Alfa Romeo platform. Reid Bigland, Dodge brand CEO, said in planning the new Dart, “we weren’t interested in building an appliance,” a jab at certain high-volume Japanese companies formerly known for highly reliable, but boring to drive, vehicles. Customers will be offered an extensive list of features and options for personalizing their Dart. All engines will be built nearby in Dundee with final vehicle assembly in Belvedere, Ill.
At the high end, Chrysler Group will be building the Maserati Kubang SUV on Detroit’s east side. The sleek, high-performance SUV will go head to head with the Porsche Cayenne, with a Ferrari-sourced 4.7-liter V8 and a starting price of about $118,000. It will hopefully more than double sales of the boutique vehicle line, much as the Cayenne is half of Porsche’s unit sales. Ford fans and non-fans alike will find the new 2013 Fusion a very desirable sedan. In the very important midsize market, the new Fusion is a very sleek and stylish design, much more contemporary than the outgoing model. Fusion is the first sedan to offer gasoline, hybrid and plug-in hybrid powertrains. Mileage with the 1.6-liter Ecoboost 4-cylinder is estimated at 26/37 mpg. Initially the vehicle will be built in Hermosillo, Mexico, with a second line to be added at the former Mazda/Ford plant in Flat Rock. Fri, Jan 13, 2012 : 6:34 p.m. I may have skipped over the dates in which the auto show is going to run for. Can you please tell. Fri, Jan 13, 2012 : 4:38 p.m.
You mentioned the two remaining US carmakers in your article. You even mentioned Chrysler (Fiat), so clearly these three automakers have plenty of new things to feature. What was behind the decision to feature a BMW, with ZERO Michigan presence in your column? Buy local, it's not just for organic, free range chickens.